When the Universe arose some 13.7 billion years ago, the Big Bang generated matter and antimatter particles in mirroring pairs. So the reigning physics theory goes. Yet everything we can see in the Cosmos today, from the smallest insect on Earth to the largest star, is made of matter particles whose antimatter twins are nowhere to be found. On Wednesday, physicists at Europe's massive underground particle lab said they have taken a step closer to solving the mystery through unprecedented observation of an antimatter particle they forged in the lab—an atom of "antihydrogen". "What we're looking for is (to see) if hydrogen in matter and antihydrogen in antimatter behave in the same way," said Jeffrey Hangst of the ALPHA experiment at the European Organisation for Nuclear Research (CERN). Finding even the slightest difference may help explain the apparent matter-antimatter disparity and would rock the Standard Model of physics—the mainstream theory of the fundamental particles that make up the Universe and the forces that govern them. But, somewhat disappointingly, the latest, "most precise test to date", has found no difference between the behaviour of a hydrogen atom and that of an antihydrogen one. Not yet. "So far, they look the same," Hangst said in a video prepared by CERN. The Standard Model, which describes the makeup and behaviour of the visible Universe, has no explanation for "missing "antimatter. It is widely assumed that the Big Bang generated pairs of matter-antimatter particles with the same mass but an opposite electric charge. Trouble is, as soon as these particles meet, they annihilate one another, leaving behind nothing but pure energy—the principle that powers imaginary spaceships in "Star Trek". Physicists believe matter and antimatter did meet and implode shortly after the Big Bang, which means the Universe today should contain nothing but leftover energy. Yet, scientists say that matter, which makes up everything we can touch and see, comprises 4.9 percent of the Universe. Dark matter—a mysterious substance perceived through its gravitational pull on other objects—makes up 26.8 percent of the Cosmos, and dark energy the remaining 68.3 percent. Antimatter, for all intents and purposes, does not exist, except for rare and short-lived particles created in very high-energy events such as cosmic rays, or produced at CERN. 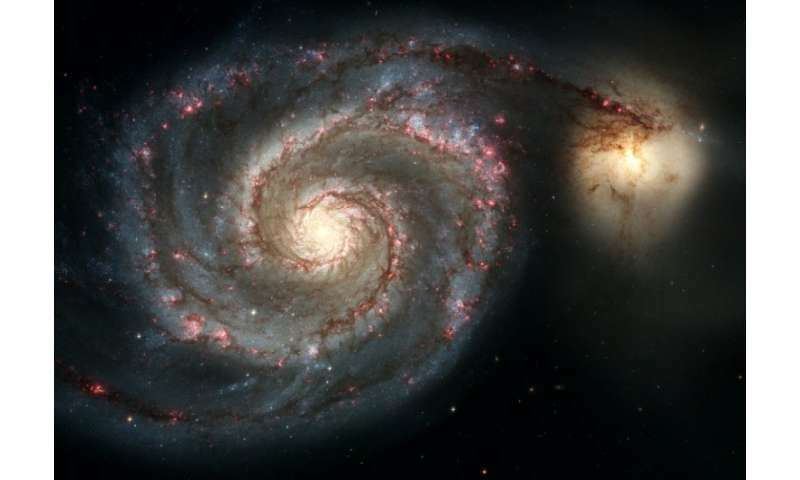 Some theoretical physicists believe the "missing" antimatter may be found in hitherto unknown regions of the Universe—in anti-galaxies comprised of anti-stars and anti-planets. At ALPHA, physicists are trying to unravel the mystery using simplest atom of matter—hydrogen. It has a single electron orbiting a single proton. The team creates hydrogen mirror particles by taking antiprotons left over from the CERN's high-energy particle collisions and binding them with positrons (the twins of electrons). The resulting antihydrogen atoms are held in a magnetic trap to prevent them from coming into contact with matter and self-annihilating. The team then studies the atoms' reaction to laser light. Atoms from different types of matter absorb different frequencies of light, and under the prevailing theory, hydrogen and antihydrogen should absorb the same type. So far, it seems they do. But the team will hope for differences to emerge as the experiment is fine-tuned. "Although the precision still falls short for that of ordinary hydrogen, the rapid progress made by ALPHA suggests hydrogen-like precision in antihydrogen (measurements)... are now within reach," said Hangst. Antimatter is not going backwards in time. Otherwise we could not store it in a magnetic trap "after" creating it. But we can. Perhaps that magnetic trap is a Klein Bottle? Resulting in Space/Time being upside down, inside out and reflecting the irrepressible thermodynamics of irrevocable entropy of this material irrefragable reality. @jav, it is certainly an oversimplification (and a common one) to claim that antimatter "is going backwards in time." There is, however, the point that CPT symmetry indicates that, since C and P reversal are experimentally upheld for antimatter, T reversal must also hold to preserve CPT symmetry. Now, T reversal doesn't mean, for example, that antimatter wouldn't stay in a magnetic trap. It's not a matter of simple reversal of cause and effect. Since the laws of physics are T symmetric, whatever "T reversal" means, it doesn't mean that. But it's worth keeping in mind the fact that antimatter is indistinguishable from CPT reversed matter. Going backwards in time is impossible. Time doesn't really exist outside our perception of it. What they will find however is that antimatter has antigravity. And this will explain both paradox of the missing anti-matter, and dark matter at the same time, as well as dark energy. As they are all the effects of the universe being full of antigravity wielding antihydrogen gas. As Antimatter has antigravity it tends to not clump and therefore there are no anti stars or heavier antimatter elements. "Some theoretical physicists believe the "missing" antimatter may be found in hitherto unknown regions of the Universe." I've never heard anyone say this. Can someone name one of these missing theoretical physicists. What makes them think these regions would be hitherto unknown? As long as the galaxies don't try to merge and so annihilate, I don't see why they wouldn't be leading a perfectly normal existence as long as they stay in their own neck of the woods. It's like survival of the fittest - those which mind their own business survive, those which don't run the risk of annihilation. @lupus, the presence of an area that contained antimatter would be immediately discernible due to matter-antimatter annihilation at the boundary between it and an area of matter. This would proceed due to the intergalactic media of the two areas. Since we don't see anything like that, it would have to be at least 40 billion light years from here by now, to be beyond the cosmic horizon. What these physicists are proposing is that this is indeed true. The problem with this is, if it is, we can never know because it's beyond the cosmic horizon and will never be visible from here. It would however explain why there is more matter than antimatter; it's only a local effect, elsewhere would be antimatter dominant. The problem with this is it sweeps the evidence under the carpet, and most astrophysicists and cosmologists would be loath to accept such an explanation without exhausting all other possibilities first. This will take a very long time, so you don't hear much talk about it. @Jabber, of course time exists. What you're saying is like claiming up doesn't exist, or left doesn't exist. The Lorentz transform turns space into time and time into space, and it's been verified by experiment. The most well known such experiment (and an early one) measured the lifetimes of muons scattering from the impacts of cosmic rays on Earth's atmosphere. What they found was, the faster the muons were going, the longer they lasted. Time is a dimension just like up and down, or left and right, or forward and backward. This is Special Relativity Theory. It's very well experimentally verified; that's only a very simple such experiment. There are many more, and the easier ones are regularly performed in physics classes around the world. Not to mention tested every day in particle accelerators. Going backwards in time is impossible. What they will find however is that antimatter has antigravity. And this will explain both paradox of the missing anti-matter, and dark matter at the same time, as well as dark energy. That's a very interesting theory but it doesn't work because if antimatter has antigravity then that same antigravity would push it all away from galaxies and thus would completely fail to explain the way galaxies are observed to rotate in such a way as to imply there is lots of invisible mass within them (which is mainly were dark matter theory came from). What they will find however is that antimatter has antigravity. I doubt it. Antimatter has positive mass, because when antimatter and matter annihilate you get exactly what you'd expect: 2 photons of corresponding energy (via E=mc^2). If antimatter had negative mass you'd get nothing. That's why stuff like PET scanners in hospitals actually work instead of producing black images. In a PET scanner you introduce a radioactively tagged substance - e.g. a tagged sugar. That sugar accumulates where sugar is needed most. Consequently most decay reactions happen there. The decay produces a positron (the antimatter partner of the electron) which flies out and almost immediately gets annihilated by any one of the gazillion electrons present in our bodies. The resulting photons fly in opposite directions (due to conservation of momentum). The origin of the decay lies on the path between opposing detection events and the time lag gives you the depth. And this will explain both paradox of the missing anti-matter, and dark matter at the same time, as well as dark energy. If antimatter were dark matter/dark energy it would make the problem much worse - not better. Ordinary matter makes up 5% of the universe. So we're currently dealing with 5% "missing antimatter"
But dark matter makes up 27% of the universe. If dark matter were comprised of antimatter we'd now have the (much larger!) problem of "22% missing matter"
So you see the problem would not be solved but actually more than 4 times greater. If anti-matter were, additionally, responsible for the effects of dark energy then the problem would get worse still - because then we'd have to be asking "where's the 45%(!) missing (regular) matter?" If I recall correctly, the antimatter imbalance is calculated by the fact that every matter/antimatter collision + annihilation results in 2 photons. Where the matter/light imbalance in the universe is approximately 1 particle of matter vs 100 billion photons. So there is only 0,00000000005% more matter left than antimatter. I'm no scientist, and really wouldn't know if every photon in the universe actually comes from matter/antimatter collisions since the BB, but this is how 't Hooft explained it on a TV show recently. As for DM, if the unknown-extra-gravity-causing-stuff really turns out to be matter, I would assume it also has an antimatter counterpart. So I do expect we will also have to account for that missing antimatter. So I presume the 100 billion photons go into the CMB, which is the product of all the annihilation going on until the galaxies eventually fall into their distinct matter or anti-matter dominated domains. In which case it would be interesting to see if there could be annihilation photons being ejected from Tabby's star, which has been disappearing at the rate of about 20% in the last 100 years as I recall. Note I'm not suggesting the object annihilating Tabby's star was formed in Tabby's galaxy: there are strange objects wandering interstellar space which have been ejected from their galaxy after being in a high speed orbit with a partner which blew up suddenly or somehow met an untimely end. Maybe there is some type of experiment we don't know about yet that would show the difference between hydrogen and antihydrogen immediately and in a big way. There could be some procedure we have never tried, dealing with physical arrangements of matter and energy that never seemed to be meaningful before. Zoom in? From where? They think the universe is expanding while observing the typical motion of matter as following some illogical concepts like we measure mass as a connotation of weight; then made it the creator of gravity by limiting the relative speed within an infinite universe of only charge or more precisely the geometrical center of its field at any point in time from its center to infinity and is only updated relative to the motion of the field center! Or better spoken Maxwell as the suggestion of the constant, a constant ratio, pi is a constant ratio. What are you doing? Day Dreaming of nonsense? Git it the program! Look! For each object within this set of objects are part of a stream greater than they can imagine! Oops! That's us! infinity, in scale, time, wavelength, measured, originated, i.e. from 0 to infinity as the possible difference from observed wavelength versus actual wavelength with objects that are have increasing acceleration with respect to you. anyway, it does have equal parity, charge is bipolar! Anyway, that is all that forms everything, all ways has been, always will be. This Fairy Tale has no beginning or end. Well any collections as orbiters of any polarity define an unstable collection; unless stated with controls. So I would expect a single orbiter;however, I don't get the anti-! By the way each charge is unique and the same; same phenomenon spatial distortion; whatever. So when you catch one doing something you cannot predict with Maxwell or Coulomb; don't call it a fuzzy particle. I take it as an insult!
. Poor and science and those who believe in it and gravity will wander away from those fools who give it such inexorable traits and origins. Imagine if the" expert " who would bring "evidence" that you were born out of nothing, but there they "fell in love" with nothing "and" something "and you were born of these" partners ". There are really too many stupid and contaminating murmurs in this field of science. Science does not know what the matter is and how it forms, and knows everything that was before that matter. Now they have an antimatter problem because they do not know what it is and how they will know when they do not know what the matter is. Such contaminators of our consciousness, should be shipped to MARS, and let them learn it well there, they will become smarter when they come back here. humy> That's a very interesting theory but it doesn't work because if antimatter has antigravity then that same antigravity would push it all away from galaxies and thus would completely fail to explain the way galaxies are observed to rotate in such a way as to imply there is lots of invisible mass within them (which is mainly were dark matter theory came from). Muons decay at rest in 2.2micro seconds which is why muons cover large distances in motion. Da Schneib> @J The most well known such experiment (and an early one) measured the lifetimes of muons scattering from the impacts of cosmic rays on Earth's atmosphere. What they found was, the faster the muons were going, the longer they lasted. . Exactly what's just been said "the faster the muons were going, the longer they lasted" muons decay at rest, to dispute this what is the largest distance a muon travels at the speed of light before it fall out the sky and decays in 2.2micro seconds? As Antimatter has antigravity it tends to not clump and therefore there are no anti stars or heavier antimatter elements. Problem is if antimatter was repulsive it and matter would proliferate in pair production with only enough energy supplied to form the particle pair. The universe would be one whole gigantic cloud of particles and annihilation. As it is it takes additional energy to go from virtual particles to overcome the quantum gravitational force and form real particles.
. Poor and science and those who believe in it and gravity will wander away from those fools who give it such inexorable traits and origins. So you don't believe in gravity? Like you're levitating somewhere on a magic carpet? Just wondering. Why do you take my views? How come you conclude that I do not believe in gravity. The whole of science and you with it, it is unknown at all, is gravity and who is causing this gravity. You accepted Einstein's completely meaningless theory that space and time were "marrying" and ordered one gang to behave and when matter "went into that" splendid network ", the" newborns "of gravity were born. This means that matter without that network it can not be born and matter remains sterile.That is why you all invite to find someone who can fertilize matter and give birth to gravity.That is a lot of fun and the prices you are repeating since Einstein all of you "bewitched"
Why do you take my views? Sounds more like your views. I accept the theory that spacetime curvatures are isobars or more like isotherms in the dark energy density and temperature of spacetime. This means that you have understood the net of curvature space time, which can show all elements related to the atmosphere on it, and that it can be given to us and isobserver and isotherms. What substance can it behave and has the ability to see these curves on it? Space and time are two terms that nature has defined to monitor the behavior of matter, formed from the Aether substance that fills that space. The space is only the place for the accommodation of matter and its movement according to the laws assigned to matter, and the time is merely the measure of that movement. Leave stupid Einstein's fuss and fatheads and believe in natural laws. What substance can it behave and has the ability to see these curves on it? I would say the Higgs field. You can call it the aether if you want, but don't tell Peter Higgs I said so please. What is the Higgs field and what are the fields in general? That science can explain these phenomena, there would be no such vagueness and fabrication in this scientific field. Higgs boson is a forgery invented in Cern experiments in particles collisions. This surrogate does not exist in nature at all as permanent and permanent. He was "fabricated" at the time of proton collisions, but scientists do not know how this particle was formed and from what and how it is currently formed and disappears. All these non-existent and non-existent particles, which were obtained by experimenters, were derived from Aether substance with increased speed of collision and under the influence of high magnetism. If they can, I can explain it to them. There are only charge and charge is bi-polar. Do not confused a configuration of a normal element with one of diametrical fields as anti-matter, that is illogical! I don't understand. It seems like you have to fabricate or create some new type of theory to explain anything really new and unusual. It is true that a completely new theory should be established for all past nebulosities and disagreements with natural laws. If we want to know what the fields are and how they arise, then we must know that everything in the material-energy universe must be formed from a substance. Discard the stupid belief that everything came from nothing (the science of BB). What is the magnetic field, and what is the electric field? When a conductor (copper wire) moves through a non-homogeneous MF, a current flow is formed in it, and a magnetic field is formed again around that conductor. What is the cause of the formation of both fields? Does this science know and whether he wants to understand? To put all this down to a theory, easily provable, you must give up the contaminating Einstein and Lorenz theory and accept that the infinite universe is filled with one substance from which matter is formed. Call this substance what you want, and I call it AETHER. Discard the stupid belief that everything came from nothing (the science of BB). I think I got it. If the universe comes from something it must be arrogance. Anyway there seems to be plenty of it to go around. [q Call this substance what you want, and I call it AETHER. Substance in this universe is all made from charge! Necessary and sufficient; therefore the AETHER is NULL. Didn't we do this already? Substance in this universe is all made from charge! Ok. So what is the total charge in the universe? Why do you run in front of a horse ramp? Immediately think that it's all an electric charge. It is necessary to know how the particle is formed and what is the charge. Aether possesses electromagnetic properties, but, as the immutable substance, he misses through all the particles formed from him. What is an electric charge? It is a particle formed by Aether with high vibrations moving along a sinusoidal radius around the energy state of a condensed Aether. This particle receives its spin which represents that charge, which is the source of the formation of electrons and other "electro-charged particles". Imagine that milk = Aether. When shake it, you get the butter = "liquid" part of matter. And when the rest of that milk is warmed up, you get "solid matter" = cheese. Is it now clearer for you to form matter from Aether?